Central African Republic children in Chad. The United Nations Emergency Relief Coordinator, Stephen O'Brien, has approved the allocation of $10 million from the UN Central Emergency Response Fund (CERF) to bolster humanitarian operations in Chad. 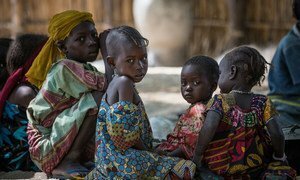 According to the UN Office for the Coordination of Humanitarian Affairs (OCHA), which Mr. O'Brien heads up, the funds will provide vital assistance in four regions of the country's south, to meet the needs of 210,000 returnees and refugees from the Central African Republic (CAR) and their host communities. According to the humanitarian community, OCHA said, the situation in the regions of Moyen-Chari, Mandoul, Logone Oriental and Logone Occidental, in southern Chad, on the border with CAR, “is of deep concern” and notably marked by deteriorating food security in a context of gradual withdrawal of aid partners due to a lagging resources. "While the UN and humanitarian partners are working tirelessly alongside the Chadian Government and host communities to help the most vulnerable, the humanitarian funding gap is growing every year, especially for forgotten crises like those in southern or the eastern Chad, where the situation remains worrying, "said the Humanitarian Coordinator in Chad, Stephen Tull. Moreover, in a context where the Chad's own limited resources do not allow it to ensure widespread access to essential services, the CERF allocation is crucial to meet the urgent needs of refugees, Chadian returnees and vulnerable host populations, while continuing to work on strengthening national capacities, he added. In total, seven projects funded by the CERF allocation will improve the living conditions of the most vulnerable populations, said OCHA. These projects will provide emergency assistance across various sectors in strengthening food security through cash transfers, nutrition services and access to health care, maintenance and improvement of water infrastructure and sanitation, rehabilitation of shelters destroyed, and access to education. Part of the funds will be allocated to UNHAS air service to maintain aid access throughout the country. Florent Méhaule, the head of OCHA in Chad said: "It is essential that other donors pledge, because CERF funding will only cover a fraction of the needs. Chad is one of the countries where the humanitarian response plan is the least funded. In addition, it is necessary to draw the attention of development agencies, to think about sustainable solutions and encourage projects that strengthen the resilience of affected populations."